This Chocolate Cheesecake is a real showstopper. It has three chocolate layers, starting with a sandy textured chocolate crust made with crushed chocolate wafers. The chocolate cheesecake filling folds melted semi sweet or bittersweet chocolate into a delicious mixture of cream cheese, sugar, eggs, and sour cream. It's sinfully rich and chocolately yet with a delightfully tangy flavor. The texture will remind you of a silky smooth chocolate mousse. While some cheesecakes may have a sour cream topping, since this cheesecake is all about chocolate, we are covering it with a shiny smooth layer of chocolate ganache. And as you might know, Ganache is a wonderful mixture of chocolate and cream, which is the same mixture used to make chocolate truffles. So it's a great addition to this fantastic Chocolate Cheesecake. When you make the chocolate crust you can use either store bought chocolate wafer cookies or homemade (recipe here). Now, the flavor of both the cheesecake filling and the ganache topping are dependent on both the type (semi sweet or bittersweet) and brand of chocolate you use. So make sure you use a good quality semi sweet or bittersweet chocolate that you enjoy eating out of hand. Keep in mind that bittersweet chocolate will give a much stronger, and more bitter chocolate flavor than semi-sweet chocolate. For this cheesecake I normally use a semi sweet chocolate with a 55 - 60% cocoa content. Once you make the cheesecake, I like to store it in the refrigerator overnight before serving, so the flavors have time to soften and blend together. The best way I have found to cut a cheesecake is to use a long knife that has been warmed in hot water. To do this, dip your knife in hot water, wipe the knife dry, and then cut the cheesecake into slices. Because this Cheesecake is very rich and should be cut into small slices, you may have leftovers. But the great thing about cheesecakes is that they can be frozen. I often freeze at least a slice or two, so I have it on hand when a chocolate crazing hits. 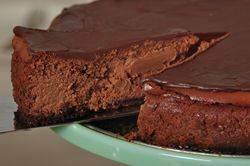 Chocolate Cheesecake: Preheat oven to 350 degrees F (180 degrees C). Butter a 10 inch (25 cm) spring form pan. Place the springform pan on a larger baking sheet (to catch any drips). Crust: In a bowl combine the chocolate wafer crumbs with the melted butter. Press the crumbs evenly over the bottom of your prepared pan. Bake for about 5-7 minutes or until set. Remove from oven and place on a wire rack to cool. Cheesecake Filling: Melt the chocolate in a stainless steel bowl placed over a saucepan of simmering water. Remove from heat and set aside to cool to room temperature. Then, in the bowl of your electric mixer, fitted with the paddle attachemnt, (or with a hand mixer) beat the cream cheese, on medium low speed, until smooth. Add the sugar and beat until combined. Add the eggs, one at a time, beating until incorporated. Scrape down the sides of the bowl as needed. Beat in the vanilla extract. Add the melted chocolate and beat until incorporated. Finally, fold in the sour cream. Pour the batter into your pan and smooth the top. Bake for about 50 - 55 minutes or until firm yet the center of the cheesecake still looks a little wet and wobbly. Remove from oven and carefully run a knife or spatula around the inside edge of pan to loosen the cheesecake (helps prevent the surface from cracking as it cools). Let cool to room temperature and then cover and refrigerate for an hour before covering with the ganache. Ganache: Place the chopped chocolate in a heatproof bowl. Heat the cream and butter in a small saucepan over medium heat (or in the microwave). Bring just to a boil. Immediately pour the boiling cream over the chocolate and allow to stand for a few minutes. Stir until smooth. Cool slightly and then pour over cheesecake. With an offset spatula or back of a spoon, evenly spread the ganache over the top of the cheesecake. Cover and return to the refrigerator for several hours, preferably overnight. This cheesecake is quite rich, so cut small slices. Makes about 14 - 16 servings. To freeze: Place the cooled cheesecake (can cut into slices) on a baking sheet and freeze, uncovered, until firm. Remove the cheesecake from the freezer, wrap it in heavy duty aluminum foil and place in a freezer bag. Seal and return to freezer. Can be frozen for several months. Thaw in the refrigerator overnight.